When I left Kunming last year, I wasn't really sure that I would ever return. The primary purpose for the visit last summer, to study the mating system of the lovely invasive vine kudzu in its native range, didn't quite pan out, as a combination of bad timing (it didn't flower until mid-July, two weeks before my departure) and rain ruined my chances for a successful study. So, around this time last year, I said my heartfelt goodbyes to those who took such good care of me during my stay, hopped on a plane, and headed back to my beloved family and friends in America, quite unsure that I would ever see this land again. But, here I am once more, back in Kunming, known as the "City of Eternal Spring," the capital of Yunnan in southwestern China. Thanks to funding from the Chinese Academy of Sciences, awarded to my collaborating professor at the Kunming Institute of Botany, Prof. Wang Hong, I was able to return to perform my pollination experiments over again. This time, my flight to Beijing and then to Kunming were booked on a Chinese carrier, Hainan Airlines. Doing a little research before I left, I became wary about flying using this carrier (though I had no choice, this trip was being paid for with Chinese government money, which had to be spent on a Chinese airline), as I read that there seemed to be less space (worrisome for a 6'4" American), worse food, and less friendly service than American carriers. I have to say that, aside from the typical discomforts associated with 13-hr flights, there was just enough space for my legs to stretch out, several movies to keep me entertained (I chose Saving Mr. Banks and The Wizard of Oz), and kind enough service to make the flight tolerable. Yes, the food wasn't my favorite, but I came prepared with some snacks of my own to satiate my bear-like hunger. Last year, having never traveled to Asia before, I found there were a few things I wish I would have known to bring to make my stay a little more comfortable. This time around, having learned my lesson, I can say I am much more at ease, initially at least, than I was upon my first Chinese experience. At the top of my list, a pound of dark roast Starbucks coffee and an Aeropress coffee brewer, instant oatmeal and peanut butter, and bed sheets have significantly improved my comfort level. Also, as an unexpected surprise, my phone from America works here without me needing to do anything except turn it on. While there are a few things I dislike about T-Mobile, I must admit that the free international service they have has taken some of the stress out of worrying how to contact people if I need help (particularly as soon as my first foot stepped on Chinese soil). In case you were wondering, the T-Mobile plan came, at no extra charge, with free data and texting and a call rate of $0.20 per minute. As most Chinese like to text, or use QQ (similar, but better than, AIM instant messenger), to keep in touch, this made things very simple for me. It does cost them 1 RMB (about $0.16 USD) to text me (which may not sound like a lot, but normal cost for them is 0.1 RMB per text), but using QQ, which most young people do, is free for all. First lunch back in Kunming. My friend Zong-Xin Ren, who greeted me at the airport at 2am (I was supposed to get in at midnight, but, after loading onto the plane in Beijing, we sat at our gate for two hours, probably, but who knows, due to bad weather somewhere), further made my reintroduction into China a more pleasant one by performing a few simple acts of kindness towards me. He provided me with a gift bag of two Budweiser cans of beer and two loaves of bread and took me, the day after my arrival, to one of my favorite restaurants in Kunming for lunch, a little place where you choose your live fish for eating, watch as they prepare it for you, and then throw it, along with some vegetables, into a boiling pot built into your table. Very delicious. On the downside, however, I arrived in China on the verge of a cold, and the nearly 27 hours of traveling did not do my health any favors. The majority of my first few days here were thus spent in bed, recovering from both jet lag and a head cold. But as the clouds in my head have begun to drift away and as I sip upon this freshly brewed cup of Joe while the breeze dances across my skin, I find it's quite nice being back in the City of Eternal Spring. Good morning, Senator McCaskill! Day two of Congressional Visits Day began with a constituent coffee "hour" with Sen. McCaskill at her office on Capitol Hill. Most Senators have a weekly gathering with anyone from their state to meet briefly with the Congressman and to have a photo taken. 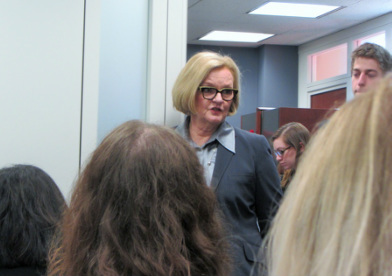 While we were scheduled for an hour meeting, Sen. McCaskill was only able to meet with our group, which was composed of five individuals lobbying for immigration reform, three couples on vacation, and Richelle Weihe (from the Missouri Botanical Garden) and me, for about 15 minutes. She started by greeting all of us and informing us about what was currently going on in the Senate (which had just struck down the Paycheck Protection Bill and were now looking at nominations for various positions). She described the battles between the "devil" and the "angel" on each of her shoulders, i.e. the "politics" and the "policy," respectively, that she has to contend with. Following that, the floor was opened up for any questions (really, any at all!) we had. The first group to speak up was the immigration group, who just wanted to know about her stance on and the possibility of any immigration reform that might be in the pipeline. Next, an older gentleman who had previously worked on military airplanes wanted to know her thoughts on proposing a bill preventing military pilots from disabling their tracking system to go "black," which, he said, happened a lot in Vietnam. Then, just as I was about to speak up, Sen. McCaskill looked at her watch and decided we needed to take pictures before she had to leave. During the picture taking, I shook her hand, introduced myself and told her where I was from, and gave her my best smile. While I didn't get to speak about science policy, I left her my business card and headed out, along with Richelle, to have a meeting in the hall with her science policy aide, Mr. Mark Fowler. It was then that Richelle and I were able to discuss science funding, my experience with federal funding for my own research, and ask him to send an invitation to Sen. McCaskill for touring the research part of the Missouri Botanical Garden. I was very positive after the meeting, having felt that our messages were well received, and, even though Sen. McCaskill did not end up signing the Markey Dear Colleague Letter in support of $7.5 billion for NSF in FY 2015, it was good to know that she is in favor of funding for the sciences, particularly in Missouri, and that it is her policy to just not sign any sort of letter. Following the constituent coffee hour, Richelle and I joined our group for the rest of the meetings. These included conversations with the staffers from the offices of Sen. Blunt and Rep. Lacy Clay of Missouri, Sen. Rand Paul, Sen. Mitch McConnell, and Rep. Thomas Massie of Kentucky, and Sen. Tom Udall, Sen. Martin Heinrich, Rep. Michelle Lujan Grisham, and Rep. Steve Pearce of New Mexico. It was interesting to see not only the differences in the offices of Senators and Representatives (the Senate offices are much nicer), but also the differences in viewpoints on science policy between the Democratic and Republican offices. The Republican offices seemed much more, well, conservative with money issues, suggesting (at least for Sen. Paul's office) that we should expect no changes in funding until after this election year and that they prefer budget cuts across the board, rather than picking and choosing certain programs to eliminate or reduce the amount of funding they receive. In other Republican offices, they were much less blunt about discussing their views on funding to the sciences, but they did have many excellent, legitimate questions for us. For instance, in Sen. Blunt's office, I spoke about the differences between science funding in China and the US, mentioning the differences in the percent of funding from year to year that the Chinese versus the American governments are investing in science R&D. Sen. Blunt's aide wanted to know from me how those percentages translated into actual dollar values (which I couldn't recall, but followed up with him in an e-mail), as well as how, in the US, the process by which scientists are awarded federal funding. 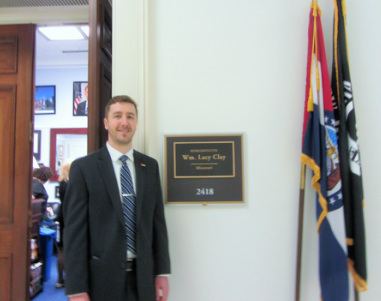 One of my main goals was to establish excellent connections with the Senate and House offices of Missouri, so that I can cultivate those relationships over the coming years, with the hope of helping to inform them on science issues. Perhaps the best connection I made was with Ms. Noelle Lindsey, the Legislative Assistant for Rep. Clay (MO), who immediately guessed I was researching kudzu when I told her I was studying an invasive plant species. She laughed as I gave her my business card, on which a photo I took of kudzu in Missouri dominates my contact information on the front of the card, recalling her father who year after year fights against eliminating kudzu from his property. This allowed me to converse easily with her about my project and how federal funding has helped me along. As I left Rep. Clay's office, Noelle said she was immediately going to text her father about meeting someone who is studying that ruthless plant he can't seem to eliminate from his life. Hopefully those little kudzu business cards and stories of my science research I left behind will likewise establish, grow, and create a stronghold in the minds of my representatives and their staff members. Congressional Visits Day, sponsored by the Biological and Ecological Sciences Coalition, American Institute of Biological Sciences, and the Ecological Society of America, is a two-day science policy event centered around the importance of federal funding for the sciences. The first day is divided into two parts: a panel discussion on science policy by members from a variety of federal agencies, which is then followed by a two-part training session on the past, current, and future state of federal funding for science and on ways to effectively communicate with public policymakers. Speaking to us in the morning on the first day were Dan Evans (American Association for the Advancement of Science), Alan Thornhill (US Geological Survey), Laura Petes (National Oceanic and Atmospheric Association), and John Dennis (National Park Service). Collectively, they spoke about their backgrounds, how they managed to get to where they were at their respective organizations, and about best practices for speaking with policymakers. For me, their stories were inspirational, as none of them started out with a focus on science policy, but they eventually made their ways into the field (such as I hope to do). It was amazing to hear about the many jobs they have and the many ways in which they help influence the scientific landscape. They explained to us that the job of a scientist in science policy is to inform policymakers on what we know about important scientific issues (e.g. climate change, invasive and endangered species, and ecosystem services such as insect pollination) and on what their likely consequences might be, so that the policymakers can then determine the best course of action. What is key here is that scientists do not directly tell policymakers what to do, but instead translate and synthesize the research into basic, relevant messages for them. In such a way, policymakers may better understand the science behind the issues for making well-informed decisions. A concern I raised to the panel was about the current beliefs/viewpoints by many of our Congressmen regarding some "hot-button" issues in science, such as climate change and evolution. My question was basically, "if we want policymakers to hear our message that federal funding for science is extremely important, how can we help to inform them on these 'hot-button' topics if they do not 'believe' that these issues are 'real,' e.g. that humans are causing climate change?" The best advice I received, and perhaps the only way to go about it, was that we (scientists) need to create and cultivate solid, long-term relationships with the policymakers and/or their staff, so that, in essence, we may lose some battles, but win the war. There is a general distrust of science and scientists, which extends from our youngest school children to our most seasoned Congressmen. The idea is to change this perception over time, by making science and research more accessible to the public and by making the way science works (i.e. through rigorous peer-reviewed processes) more transparent. Only in such a way can scientists begin to win the trust of the public back, and, in the process, help to make them more well-informed on issues that are and will likely continue to have a significant impact on their lives and livelihoods. In the afternoon session, Kei Koizumi, from the White House Office of Science and Technology Policy, presented a big picture look at President Obama's 2015 budget proposal. As mentioned in my last post, President Obama definitely sees how federal funding in science research and development has made our country a global leader in both basic and applied science. Despite his viewpoint, increases in federal funding have remained below the level of inflation for several years. There are, however, some bright spots in the proposed budget dealing with funding to science R&D. First of all, there is a great investment in climate change research, to the tune of $2.5 billion per year. Rather than spending this money solely on understanding, predicting, and assessing the effects of climate change, a major focus now is on ways in which we can adapt to the consequences of a changing climate. In addition, there is a 4% increase in funding proposed for STEM education and training. Of the $2.9 billion dollars budgeted for STEM, $320 million would go to the Department of Education to support 100,000 new STEM teachers and $118 million to improving the retention of undergraduates in STEM fields after they graduate. Mr. Koizumi also outlined for us three of the biggest misconceptions by policymakers about science funding. These were: 1. half of federal funding for science research is awarded to academic universities/colleges; 2. these awards are the result of a competitive and rigorous peer-reviewed process; and 3. federally-supported scientific research means jobs for a "lot of people." After this helpful day of science policy overview, and with all of this information and numbers swimming in my head, I went to sleep well-prepared and excited to meet with my Congressmen in the morning. Photo: In between the morning and afternoon sessions, I was able to do a little D.C. sight-seeing around the White House. This past summer I traveled to China as a National Science Foundation (NSF) East Asian and Pacific Summer Institute (EAPSI) Fellow to conduct research for my dissertation. At the onset of the program, we visited the United States Embassy in Beijing to get a primer on the current affairs of and the scientific and technological developments in China. One of the embassy officials, Deputy Chief of Environment, Science, Technology, and Health Affairs Section Dr. Eugene Bae, particularly caught my attention as he made comparisons of the state of scientific development and investment in China to the US. At a time when budget issues and misperceptions of science research are plaguing scientific progress in the US, China is significantly increasing its investment of federal funding into scientific research and development. To put it into context, from 2012 to 2013, China increased its investment in overall R&D from about $197 billion to $220 billion (an 11.5% increase), whereas the US increased its R&D funding from about $419 billion to $424 billion (a 1.2% bump). For science R&D in particular, China increased its funding to about $44 billion (over a 10% increase), while the budget for federal US agencies remained nearly flat at $64 billion. So, yes, the US still invests more money in R&D than any other nation (including China), but, if this trend continues, China will overtake the US as the world’s leading producer of science research by the early 2020's. 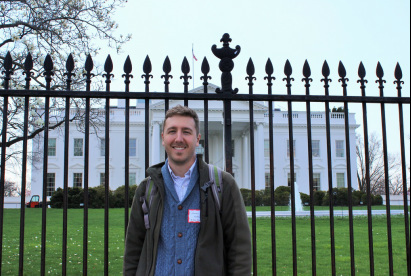 Given this rather bleak financial landscape, I was truly honored and thrilled to be representing the Botanical Society of America at the 2014 Congressional Visits Day this past week to advocate for federal science funding. The message I was delivering was simple and straightforward: sustained real growth in funding for the sciences. In its current form, President Obama's budget proposal for FY 2015 requests $1.014 trillion for discretionary spending, with $135.4 billion set aside specifically for federal scientific research and development (of which about $65 billion would be used specifically for research). While this does represent an overall increase in funding to science R&D over last year's budget (+1.2% relative to FY 2014), this is still well below the anticipated 1.7% increase in inflation for 2015, and, if our nation wants to maintain our stronghold in the sciences, this is not sustainable. But this is not news; as alluded to before, science funding remained flat for much of the 2000's (with the exception of 2009, which benefited from the stimulus package) and from 2010-2014 funding was likewise either stagnant or reduced. Of the $135.4 billion for science R&D in President Obama's proposal, $7.255 billion is designated as the budget for the National Science Foundation (NSF), which provides 24% of all federal funding for basic research at universities/non-profits in America and 66% of all biological/environmental research. This is highly disconcerting, as the number of researchers earning PhD degrees in science has nearly doubled from about 450,000 to 800,000 in the last decade. Thus, while America's institutions are generating highly qualified scientists, those scientists are finding it nearly impossible to do the research they were trained to do (funding rate for proposals to NSF is about 4-5%). Furthermore, if the proposed budget is passed, NSF's Directorate for Biological Sciences (BIO) program, under which my area of research falls, would be the victim of the largest cut in funding for FY 2015 (-$12.75 million compared to FY 2014). Thus, while I was in D.C. to generally advocate for sustained real growth, I was specifically there to ask for $7.5 billion in federal support for NSF for FY 2015, which, though still under the predicted level of inflation, is $245 million more than currently proposed. Despite such stagnation in federal funding, science R&D nevertheless remains a cornerstone of America's society and economy. As President Obama pointed out in his 2014 State of the Union, without such federal financial support, we wouldn't have things like Google, smart phones, vaccines, or paper-thin materials that are stronger than steel. Moreover, for every dollar of federal investments in the sciences, about $2 is returned. In my home state of Missouri, nearly 25% of jobs require some degree of STEM (science, technology, engineering, and mathematics) training. Federal investments in science have helped to make America a world leader. Join me in advocating for sustained real growth in federal funding for science to ensure our future is as bright as our past. AAAS Project 2061 is developing assessment items to measure elementary, middle, and high school students’ understanding of ideas about energy and recruiting teachers willing to field test multiple-choice test items with their students in Spring 2014. Registration deadline is April 9, 2014. Go to http://www.aaas.org/news/teachers-needed-science-assessment-field-tests for information and registration. 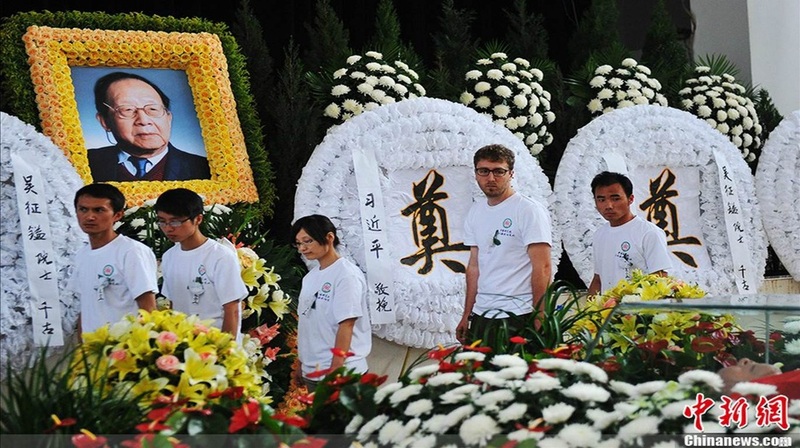 Mourners congregate in lines as one-by-one each line of people moves forward to place a flower at the feet of Wu Zhengyi, bows three times, and pays their respects to his family members by shaking hands and saying a few words. spearheaded the establishment of China's first national park, and was influential in the eventual construction of a seed bank at KIB (where I am located, and within whose walls I have trod) as a means of protecting the world's plant species (primarily currently focused on Chinese plants) from extinction (source: gokunming.com). He was a conservation visionary, a "living [botanical] encyclopedia," and the father of Chinese botany. Tissue paper floral displays with messages to Dr. Wu lined up along one of the walls. A line of students, including me, passing behind Dr. Wu after paying our respects. all were given a chance to say their goodbyes. After we offered our condolences to the family members, we exited through a side door and were offered little pieces of Chinese candy. As each of us students enjoyed our small sweet outside the memorial hall after tasting the bitterness of loss within, the music from the band of soldiers called us back to their attention as the pallbearers, dressed and gloved in white garments, solemnly ushered Dr. Wu into a van, the front of which was decorated with many flowers, that was to deliver him to his final resting place. We stood still and watched as the van carrying Dr. Wu drove towards the mountains of Kunming, where the plants Dr. Wu loved so much were silently weeping. Every traveler should be so lucky as to have a Ming Zhu in their lives. This was my second weekend in Kunming, but my first where I had nothing to do other than what I had planned to do, which, as of Friday night, was going to be the path of least resistance: doing nothing. Instead, my friend and fellow EAPSI participant, Chris Ortega, a die-hard Texan (he actually brought the Texas flag to China, though he is not yet proudly displaying it for the Chinese world to take in) who is a Materials Science graduate student at Houston, invited me to come down to his hotel and stay the weekend. There are a total of 30 China EAPSI fellows this year, but half stayed in Beijing for their work and only one other, Chris, ventured to Kunming with me. 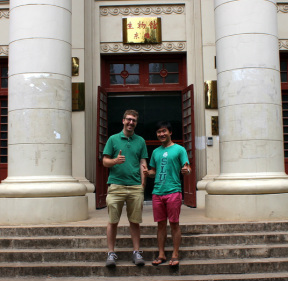 Whereas I am in the rural North of the city, Chris is in the thick of things, located right at the southern edge of one of the campuses of Yunnan University, where my friend and former fellow SLU Biology graduate student, Ming, is now an assistant professor. Initially hesitant, I decided (with my wife's long-distance coaxing in my head: "you should go out and have an adventure") to give it a try, so I hopped into a taxi, showed the driver the address on my phone, and prayed that this kind-hearted soul understood where I was headed and would lead me in the right direction (and not around in circles). Thirty-four yuan (about $5.50) and one hour later (it took me a half hour to walk to a place where I could actually hail a cab) I did indeed arrive at Chris' hotel. After chatting with my family on Skype for an hour, I headed out with Chris to experience some American style food in China. 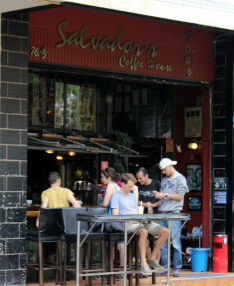 For lunch we patronized a cafe named Salvadore's. Their menu spans the gauntlet of American food: burgers, spicy chicken tenders, lettuce salads, quesadillas, American beers, grape wines, espressos, ice cream, you name it. As you can get a hint of from the picture on the left, Salvador's is the place where many foreign tourists [read: American ex-pats] go for a taste of the West. When we arrived, there were but just a few Chinese people eating here, wherein jazz music was playing, books (all in English) graced the entirety of one of the walls, and salt and pepper shakers mingled on the tabletops. Truly, if you had your back to the door and if the Chinese waitresses were supplanted with American ones, you could not tell you were in the heart of the Yunnan province in China. Having eaten primarily Chinese food for two weeks, Chris and I both wanted a bit of variety in our diets. The restaurant proved up to the task, and we came back later that night for dinner and drinks. Having unsuccessfully attempted to gain contact with Ming through two e-mails and one phone call last week, I was doubtful that a phone call to him on Saturday night while I was near him would prove fruitful. To my surprise and delight, Ming did answer my call and was thrilled (beyond thrilled, really) to hear that I was in Kunming and so close to him (the e-mail address I had been writing to is infrequently checked by him these days). Around 9pm he met up with Chris and me back at Chris' hotel room, where our reunion was joyous. I introduced Ming and Chris to each other, but, as it turns out, they had already met a couple of days prior at the gym, and Ming, of course, made it seem like they were old friends. My first year of graduate school was made ever the more bearable by my friend Ming (at the time a fourth year grad student), whose happiness and shear joy for life and concern for friends is unmatched. Ming's intense desire to help me and others in graduate school permeates every aspect of his life and, I now know, is only the more concentrated in his homeland. After chatting for some time in the room, Ming took me (Chris stayed behind to talk with his girl whose in the States) for a walking tour of the nightlife of the city. Our journey took us past many bars whose tables were packed with young people drinking beverages and playing games to Green Lake, a beautiful area where several traditional performers were playing with their music as lights danced off the water behind them, and then finally back to Salvador's where Ming and I shared a couple of dark beers and warm conversation. The next day Ming met us back at the hotel room at around 9:30am. From there he took us to a great traditional rice noodle joint for breakfast. It was one of the spicier breakfasts I ever had, but was nonetheless delicious. We then walked over to Yunnan University where Ming showed us the genetic disorders lab in which he works. While we were in the lab, Ming showed us a couple jars of "specimens," one which contained a human embryo and another which contained an infant that had two heads [note, if you are interested, I have a picture of this you can access from the flickr link below, but if you's rather not, just ignore the photo]. After getting a taste for Ming's life as an assistant professor, we walked to the WalMart where Chris bought a chess set and I bought a proper pillow (the ones I had been attempting to use at my apartment were more like thin strips of cloth than pillows... plus this one has lavender), and then we were off to Heavenly Manna for lunch. Heavenly Manna, I noticed from a plaque on the wall, had won best Chinese food in 2007, and I could taste why. Each of the five dishes we had were well-spiced and contained no MSG (a rarity in China)! I think one of our dishes, the beef with fried mint leaves, was even spiced with a curry. Having had our fill of food, Ming ushered me to the bus stop where he had me take pictures on my phone of the Chinese characters for the names of the stops that I needed to take to get back home. Taking the bus was less than ideal for me (I'd have rather just hopped back in the taxi), but the bus only costs 0.9 yuan per trip if you have a bus pass (which, thanks to Ming, I had in hand), and he assured me it would be easy enough - which it was. As I said, every traveler should be blessed enough to have a Ming with them. Ming has big plans for us over the next several weeks. I'm looking forward to having my feet placed in some water at a spa where some fish will nibble the dead skin off of them, traveling to the beautiful cities of Dali and Lijiang, and tasting some of the teas that his friends sell. Without my friend here, I think I'd struggle with just leaving my front door. The best way to really get to know a place is to walk its streets, or at least that's how I came to justify a six hour, 20km round trip walk to Starbucks. Yes, my intention was to grab a cup of coffee, having not had one since entering China airspace. Yes, I knew ahead of time that the closest Starbucks was about 6 miles away from my hotel. No, I did not know what walking eight miles meant. The experience was, however, enlightening, as there were a number of impressions that I came away with. One of the first things I learned was that on the streets of China, you are not a pedestrian but a vehicle, to which nothing yields, and, in fact, cars have the right-a-way. And if your body comes into contact with a motor vehicle and you decide you may want to have some words with the driver, you might want to think twice. On my walk back from Starbucks, I witnessed an incident whereby a Chinese driver got out of his car in the middle of the street (it was, at least, at a light - though the light was green), came up behind this white guy, shoved him to the ground, kicked once at his ribs then punched once in his face. The white guy looked stunned, obviously, and began shouting in Chinese to the attacker, whose car, mind you, is still in the street unattended. After shouting for some time, the Chinese man began to walk back to his car, scowling the whole time at the white guy, who walked off and checked his back to see if his laptop or other goods had been broken. He looked visibly shaken (as was I just from witnessing it), but, other than a scrape on his face, he looked to be managing alright. I was never sure what provoked the driver to attack this man, but my guess is something happened with his car at the intersection. 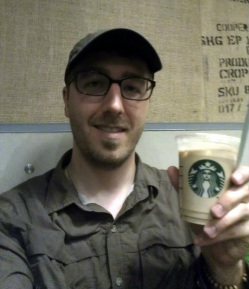 I also learned that if you are looking for an American in a foreign land, you can almost always find one or two (though I was the only American traveling solo at the time, all others were in pairs) of them at the Starbucks. After entering the store, I came upon two Canadians who were all smiles, having already purchased their cups of liquid bliss and a couple of souvenirs. Apparently if you are also in the need of a Canadian in a foreign land, you can also find them at a Starbucks. During my brief stay, two couples of Americans also came in the store, but, to my dismay and longing to make a friend in a foreign land, they had nothing to do with me. But no matter, I couldn't stay long to chat anyway, for it was nearing 5:00pm, and I wanted to make sure I had enough (3 hours worth) light to walk back in. My experience with the Americans in Starbucks is similar to my experience with them throughout China. Either they are interested in talking to you and having a conversation or otherwise they completely ignore you, the latter being the most frequent case. I don't know what it means, but I'm of the type that is looking for a friendly face around every corner, seeking a little familiarity among all that is strange to me here. Perhaps others think don't want to be the "Americans," just hanging out with other Americans and ignoring the local people. Rarely on the street was I greeted by a local Chinese person with a smile. Perhaps being a big tall American they are a little skeptical of me. Every person on the street I pass, whose eyes I meet, I try to cast at least a half smile on them, hoping for one in return. The little children are, by far, the ones I get the return smile from, but even this is rare. I'm not saying that the Chinese are unfriendly, but perhaps just cautious of strangers. In fact, once you become friends with a Chinese person, they treat you like family. For instance, my Chinese collaborators and graduate students are very attentive to my needs, more so than I actually need. If I even mention I am in need of something, they will talk with others about it without me even being aware. I mentioned in passing to Wei one day, last Saturday actually, my desire to go to a Catholic church, if there was one. He was not aware of one, but, two days later, told me he had asked around and maybe had a lead on one. Concerned over me not eating as much as he thinks I should, Wei also took me to McDonald's and bought me two spicy chicken sandwiches and fries. They also try to accommodate me by speaking in English when I am around, which is nice because more often than not I don't know what they are speaking of to one another. I also learned that, though Kunming is the capital city of Yunnan, Yunnan is one of the poorest provinces in China, and, thus this city is still a much developing city. There is construction around every corner, which means there is also a lot of dust and particulate matter floating in the air. Though this is not ideal, I prefer this over the smog of Beijing any day. But things are built with an unmatched rapidity here in China. Buildings are raised and storefronts are changed within months and days, respectively. This means that my experience and the sights that I take in here and now will be somewhat different to someone visiting next year and completely different to another visitor who comes in five years. It is much like a river, always changing. So, yes, my quest for Starbucks was successful, though it was a grueling walk. I not only was revived by the coffee, but I got to experience some of this strange city, which is now, just a little, a more familiar sight to my foreign blue eyes.